Re: Asterina Seastar Populations, & Gnathophylliid f' - 03/21/08 Thanks Eric. 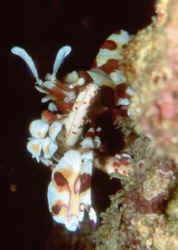 <<Welcome Vinh>> Do Harlequin shrimp is reef safe, and peaceful with other inverters? Thanks, Vinh <<Depends on your definition of "reef safe" I suppose…but other than Echinoderms, your other inverts should be spared from the shrimp's diet. Re: Question on Harlequin Shrimp... Price Gouging... No, Supply and Demand... What the Market Will Bear... Future Breeding Efforts 8/30/07Michelle - <G'day Ray!> I just had to reply ... (any excuse) <Heehee!> I guess it is just a justification for paying so much, but if I don't get them, someone else will, and I will miss out. <It's OK. It is up to you. It is your decision. It is your money (I'm presuming you didn't rob a bank! Or if you did, then it is not your money and give it back!) and your decision as to whether you choose to use that money to have the privilege of being solely responsible for the care and health of these beauties.> I think these little critters are worth getting hold of, and I do so knowing full well that I am being taken for the ride of my life. <You are making an informed decision. You know that they sell for significantly less in other countries, but that does help you when importation is not possible (or doesn't appear to be possible). So this price, thought exorbitant elsewhere, is likely what your current market will bear.> I will be trying to breed them, and rest assured that I will indeed let you know how the breeding attempts fair. <Look forward to that! I do wish you much success. The Project Dibs (Desirable Invertebrates Breeding Society) website may be a good resource for you. Their mission is to create an online community collaborating on openly sharing knowledge of how to breed marine invertebrates. They do have a good deal of information and is a worthy project.> I don't expect to be successful, but if I pamper them enough, you never can tell. <Well, I can tell you it will take a lot more than pampering! There is a lot of work that is required of such an effort. At this point the care requirements of the fry is not understood. Success may come, but only after a lot of trial and error, and likely a good bit of frustration and perhaps heartbreak. But, hopefully success will be achieved!> I have been looking for all the info I can get on the subject and I think feeding will be the greatest challenge (as it usually is with fry). <Mmm, feeding the fry is a challenge, but from what I read, I don't think that is the biggest challenge; the unexplained deaths would be my biggest concern. Feeding might be less of a challenge if you are near tropical water which perhaps you (hopefully) you are.> I've bred a few marine species in my time, <Then you may have some good experience to draw from. It is likely good that you are considering purchasing these beauties. You have the means, experience and desire to perhaps advance the reproductive efforts of these lovely shrimp.> and I definitely think they will be well worth the challenge. <Will be a challenge for sure! I wish you much enjoyment and much success! Mich> Ray. Re: Question on Harlequin Shrimp... Price Gouging... No, Supply and Demand... What the Market Will Bear... Future Breeding Efforts My dearest Michelle - <My dearest Ray, how shall I start the love letter? Heehee!> Rest assured, I did not rob a bank in order to afford the Harlequins <Whew! I can sleep now!> ... but a bank loan was definitely an option ... <Heehee... such is this hobby/illness/addiction...> Actually, it was plain old desire. If you want something enough, you'll find the money. <So has been said.> The DIBS will be a place I will frequent, in my search for knowledge. Thank you very, very much for that little gem. <My fellow crewmember, Brenda, pointed me to this little gem, so we must thank her as well!> I think that success in breeding such a difficult species may well lie in scientific rationale + trial and error, rather than hope and heartbreak. <Oh I absolutely agree, hope and heartbreak are often the emotional products of trial and error for those who are gifted enough to connect to their emotional being.> I don't assume to be the person the "break the code", but I may achieve some limited success, and in doing so, pass on what I learn, so that the progression of knowledge will lead to success for someone else in the future. That is my realistic view, <A noble goal.> but my heart still wants me to be the one (we can dream anyway) ... <The dream is often the first step.> I appreciate, and thank you for your encouragement. <You're very welcome my friend, and I do hope your dreams come true. Mich> Ray Grinberg. Re: Question on Harlequin Shrimp... Price Gouging... No, Supply and Demand... What the Market Will Bear... Future Breeding Efforts... A $A350 Purchase! More breeding thoughts... 9/10/07 Lovely Michelle - <Precious Ray> Glad to know I'm not annoying you too much. <Nope! Not at all.> Charles contacted me and we have e-mailed a few times since I wrote you last. <Oh, Terrific! I am glad to hear this!> He says that I am the only other person he knows of that is attempting to breed these creatures. <Really!?!? I am quite surprised by this, perhaps there are others who are just not "vocal". Have you searched other forums, ReefCentral etc?> No one else has contacted him through his page, <This I can believe. Was a challenge to find his email on his site. Perhaps better email placement may encourage more contact.> and we are going to keep in contact regarding our efforts, <Very good!> and see if we can figure it out. <Often two heads are better than one.> The biggest problem we face it seems is feeding the larvae. <From what I've read, does seem to be a challenge, finding appropriate and small enough foods. Not knowing the natural diet is a challenge.> Once we crack that, we will be world famous breeders of Harlequins... <Hey, ya never know! Could be your 15 minutes of fame! You should at least be able to get published! I want an autographed copy! ;) > I am trying to condition my guys by providing a completely stress free environment (including stress by less than perfect water quality), <Good.> and plenty of their favourite food (which I won't mention). <Heehee! Thank you! Much appreciated!> Also, I am taking into consideration other factors often overlooked such as temperature range (and/or variance) plus water movement, as these sorts of things are often triggers for breeding behaviour. <Yes and the phase of the moon is often quite an important breeding queue as well.> I will get more information from Charles, regarding conditions on his tanks, so that should go a very long way to getting them producing eggs. <Yes, to have someone who has had some degree of success will be most helpful. You should be able to help each other quite a bit. There are others out there who may be able to assist.> Once I get them happy enough to produce eggs, half the battle will be won, <Yes.> but the most challenging part will begin. <Absolutely. Raising the fry is challenging to say the least!> I have no delusions of getting it right straight away, but if I can have even limited success before they get too old, I will be happy. <Ahh, good.> Tons of gratitude to you once again, <Glad I could be of help! Please continue to send updates.> and if you were close by, I would hug you. <I always appreciate a hug! Michelle> Ray. Re: Question on Harlequin Shrimp... Price Gouging... No, Supply and Demand...What the Market Will Bear... Future Breeding Efforts... A $A350 Purchase! More breeding thoughts... 9/7/07 Darling Michelle - <Sweet Ray> I really, really love to write to you, but please let me know if I am wasting your time. I don't wish to become a burden on your time, so you must tell me if you are too busy. <Not currently...> I just wanted to let you know that I have e-mailed Charles and Linda to thank them for their page on Harlequin breeding, <Very thoughtful of you. I'm sure your kindness will be meaningful and appreciated.> and thank you and Brenda for sending me there. <You are quite welcome and I have informed Brenda as well.> You asked me why I moved so far away from my coral world ... The answer is life. I needed to get out of the small town I lived in, and find a life with better opportunities, so I move to our state's capital. <Ahh, yes, I can very much relate and am making strides toward such a move myself... but hopefully towards the octopus' garden, not away.> I can tell you that had I not moved, I doubt I would be e-mailing you now ... so it's all a progression, <Yes, I understand, growth and change are indeed good.> as it will be with breeding "my" Harlequins. The first thing to do is set up a tank to raise the larvae in while mom and dad are settling in properly, <Acclimation and time is good> and then try to condition them to produce eggs. <And just how you going to try to condition them to do that? Heehee!> So .... here goes ... <Are you ready?> It all begins ... <Excellent! As Confucius said: "A journey of a thousand miles begins with a single step. "> *Hugs and Gratitude for your support* <Thank you very much Ray, been a while since I've received much of either and they are appreciated. Michelle> Ray. 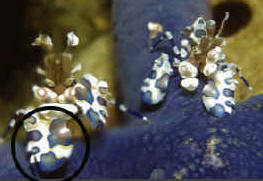 Re: question on Harlequin Shrimp - 09/14/07 Beautiful Michelle - <Dearest Ray> My little Harlequins seem to be very shy. <I'm sorry. Makes it more difficult to enjoy them.> They rarely come out of their cave, so observing them is often difficult, <perhaps more time to acclimate will help these guys get more comfortable.> but they seem happy enough, and feeding well. <Oh good!> Water quality is spot on, so all I can do now is wait. <Time and patience...> I've only had them a week and a half though, so I may have to wait a while yet. <Yes, Hopefully they will become more secure and outgoing with time.> I don't think the food issue for the larvae is the biggest problem. <No, I didn't think so either from what I had read on the DIBS board, the unexplained deaths are more concerning in my opinion.> Charles seems to think that his water quality has been to blame for all the losses of larvae, <Again from what I read, this does seem like a reasonable/logical conclusion.> because he has observed them feeding ravenously on copepods in his rearing tank, but he just can't get them to live longer than 7 days. <Could be something else as well.> The water quality issue may well be true, <Yes.> but he is awaiting a new batch, due to hatch any time now, <Excellent! Please keep updating.> so it will be a big leap forward if he can make it work this time, even if it's just a few. <Oh! Yes! Most definitely!> I intend to do things a little differently to Charles, <Trial and error... doing things slightly different is called experimentation ;) and is often how we learn and at times succeed. Just document what you do and how you do it.> but he has found a suitable food, <A large obstacle to overcome!> and I'm hoping he has more success this time. <Me too!> The challenge is worth it, <I'm glad you feel this way.> and I'm just excited to have mine produce eggs at this stage, but who knows if and when that will be. <One hurdle at a time.> You know a little about what makes me tick, so what's your interest? <After many years of longing I was recently certified to SCUBA dive and I have much enjoyed doing this, though I'm not doing it as much as I would like. It is wonderful to see so many of the creatures I am familiar with, in their natural setting... and the "tank" maintenance is so much easier ;) I am also quite a passionate above and underwater amateur photographer. I have much to learn in this area. I enjoy traveling and have been quite fortunate to do quite a bit this year and hope to continue this trend. Perhaps making it to your country at some point in the not too distant future, I would really love to see the GBR. My father spent over 33 month in the South Pacific including Australia, New Guinea, the Philippines and I believe he made it into Japan as well fighting in WWII. So I grew up hearing many stories about the wonders of your country. My first "research" paper (in 6th grade mind you) was titled The Marsupials of Australia. I also enjoy interior decorating; swimming, actually diving more so; hashing, running of sorts; spending time with friends; helping and sharing with others; and philosophizing, laughing, and chatting with interesting people.> Do you keep marines yourself? <Barely... my tank is more of a nuisance algae farm at the present moment. I hope to be relocating soon so it has been rather neglected.... Michelle, hanging her head in shame...and grateful that no one can see her tank.> Ray. Re: Question on Harlequin Shrimp - 10/04/07 Michelle : <Hello my friend> I hope you get this in time ... <I did, but just barely! I leave in 3 short ours from now!> I write, feeling very much like an amateur. <Uh-oh!> I went out last night (Wednesday) and got back rather late. I used a flashlight to check on my shrimp before I went to bed, <Tuck them in!> and the tank was a mass of larvae. <WOW! YAY! I'm so happy for you!> I couldn't figure it out at first, because I didn't even know she had eggs, but after a closer examination, I found them to be shrimp larvae. I was both gleefully surprised and pitifully ashamed at the same time. <Heehee! Mixed emotions indeed! But a fantastic discovery!> I check the female nearly every day for evidence of eggs, but I never saw them. How foolish I feel, but how excited for the future. <Heehee! Great that they are reproducing so soon! Well, it would likely help to know exactly what the eggs look like, which I doubt you've seen before and you may not really know what you're looking for until your little guys have had a couple of spawnings. Pictures help, but until you've seen such with your own eye... But this is wonderful news! I am much looking forward to your updates! Feel free to write as I'm gone thought I won't be about to respond for a while. > It looks like those links will be coming in handier sooner than I thought. <I guess! Glad I could get them for you!> Enjoy your trip, <I sure hope to! I am very much looking forward to being in the warm, clear, water with a camera!> and please take care, and be safe. <Thank you Ray. I appreciate your concern. Looking forward to hearing about the future developments! Hugs, Michelle> Ray. Harlequin Shrimp and Wrasse Dear Crew: <Scott F. here today> I would very much like to put a Harlequin Shrimp pair in my 58 gallon reef. I realize their eating requirements.....starfish only. The inhabitants of my tank include a royal Gramma, pajama cardinal, midas blenny, 2 neon gobies and a 6-line wrasse. It's the wrasse I'm worried about. Would it bother the Harlequins? Thanks for your help......Janey <Well Janey, there is no 100% guarantee, but if it were me- I'd feel comfortable with this combination. Keep in mind that a larger Sixline wrasse could potentially attack a shrimp-not likely, but not outside the realm of possibility, either! Regards, Scott F.